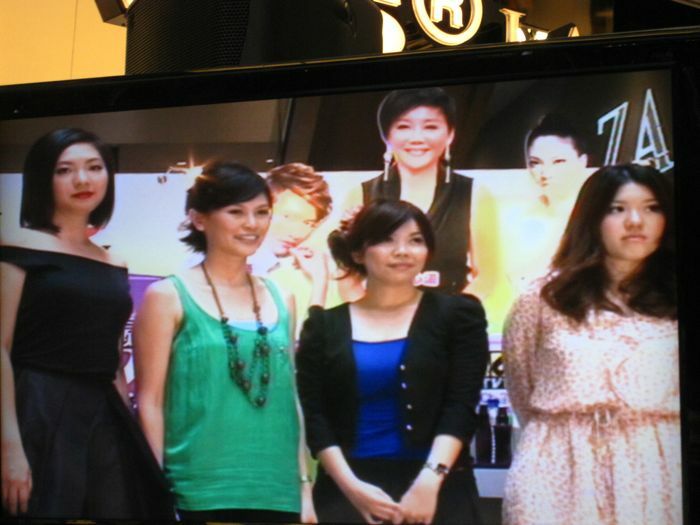 The popular Taiwanese makeover TV show Nu Ren Wo Zui Da (女人我最大之) was in town today at 313@Somerset for a Lady First LIVE Make-over (都会达人大改造). 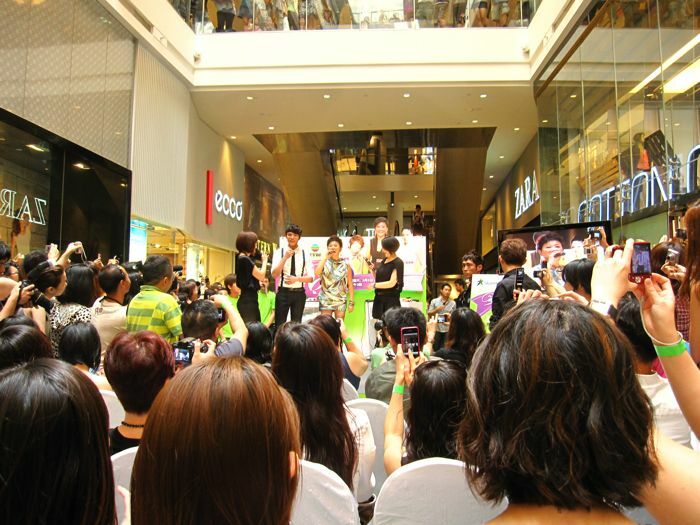 Celebrity host Lan Xinmei (蓝心眉), stylists Xiao Kai (小凱) and Xiao Man (小曼) were specially flown in for this event. For those of you who are not familiar with the show, Xiao Kai (who was on his first visit to Singapore) is the resident makeup artist while Xiao Man (in the black outfit) is the resident hairstylist. Xiao Man is a frequent visitor to Singapore where she has clients. The 46-year old Lan Xinmei started out as a songstress but is more widely known now as a show host. The three were challenged to style three ladies using the same green T-shirt. Lan Xinmei drew the biggest laughs when she applied her lipstick and proceeded to do lip prints right on the T-shirt! Xiao Kai showing off his creation. 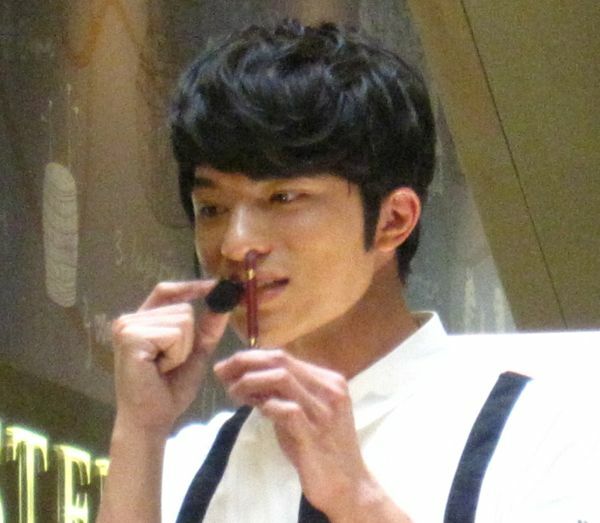 The winningly handsome Xiao Kai once took 9 hours to do Lan Xinmei's makeup for the Golden Horse awards. 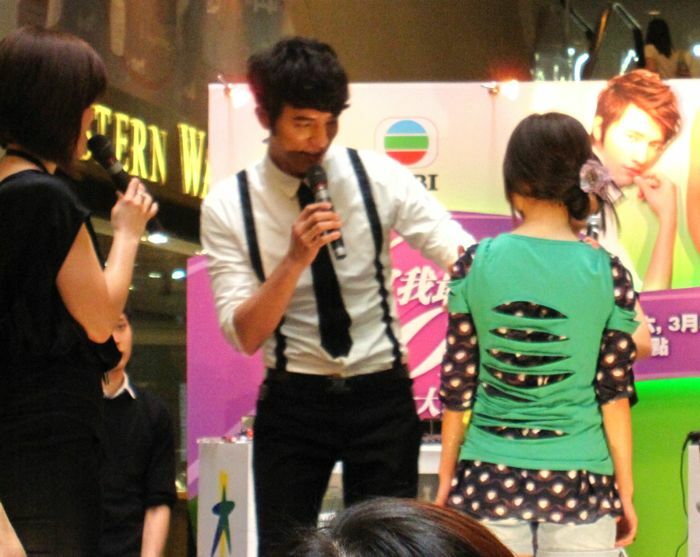 Xiao Man told the crowd laughingly, "Don't just smile at me and scream for him!" After the T-shirt challenge, Lan Xinmei left the stage while Xiao Kai and Xiao Man did makeup and hair makeovers for four participants. 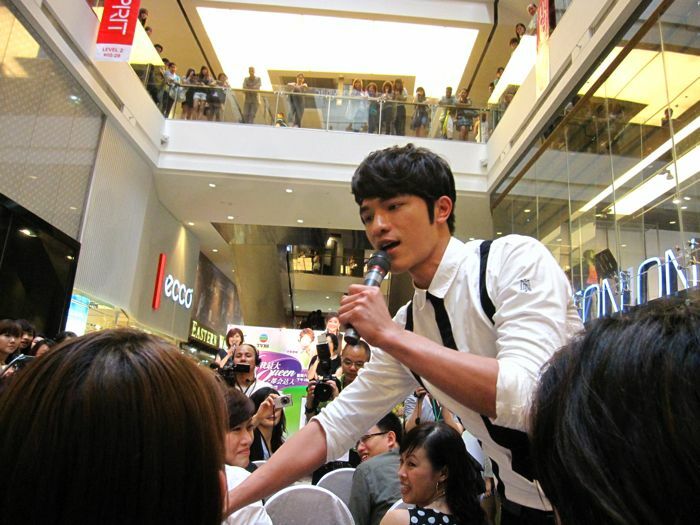 The crowd was in a virtual frenzy when Xiao Kai started giving away makeup products. For smudge-free eye makeup, Xiaokai recommended a waterproof eyeliner. For our humid weather, he recommended this ultra-light mousse makeup base. I couldn't see it clearly but it looked like Shu Uemura's UV Under Base Mousse from the Mika Ninagawa collection. He did a lovely red lip on this participant. 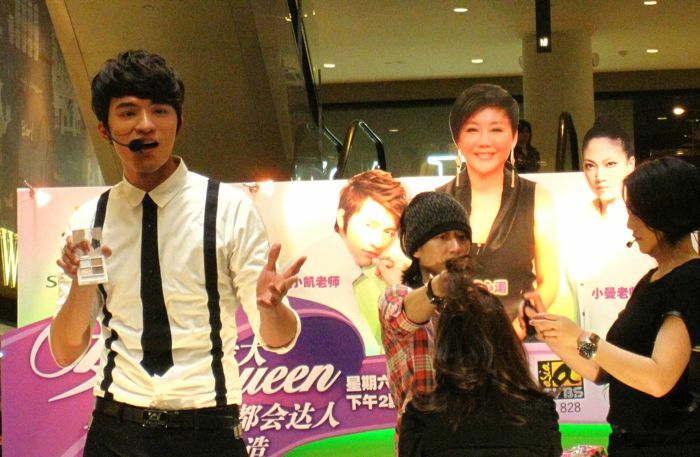 Xiao Man's hairstyling skills were on full display as she gave one participant a complete haircut right there on the stage in less than 15 minutes. She cut the fringe of another participant and gave both of them glamorous, chic dos in ultra-quick time. She also dispensed haircare advice to various audience members by examining and sniffing their scalps. Thanks to Ms Glitzy for the invite! wow Iris, I was thinking of heading there this afternoon but glad I didn't after looking at the crowd in your photos. thanks! was it fun? 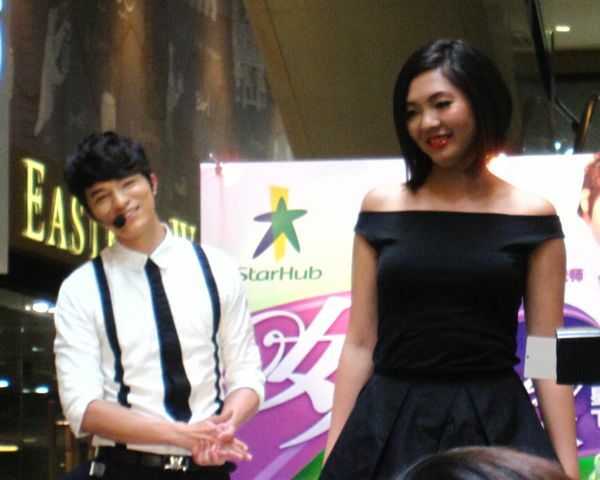 Lan Xin Mei looks so skinny! Yup, it was great fun as the three were very humorous. Xiao Man's expertise was just amazing. Actually the crowd wasn't that bad. There were many people watching from the upper floors, with quite a bit of space to spare. 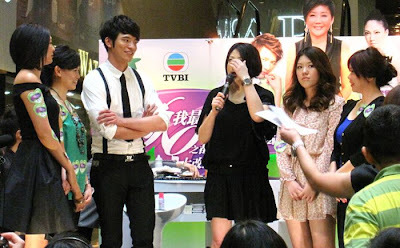 Lan Xinmei's legs are super skinny! Any idea this will be broadcasted as one of the show's episode in coming week?? Can't wait to watch it. I had asked the organisers but they said that the date of telecast has not been fixed. Why did he put the eyeliner nearly up his nose? He's actually holding the eyeliner some distance from his face. It's just the angle that the photo was taken at. Kevin Lao shi is coming to Singapore this 5-7 April 2011 for a John Little Event. He will be appearing at jurong point, marina Sq n Plaza Singapura.